Running an analytical laboratory is no small feat – depleted supplies, broken equipment, difficulties in data interpretation and the stress of having to deliver results on time all make it a far cry from the lofty desk-job it first appears to be. The prospect of designing simple, disposable test kits for standard diagnostics is coveted by biologists and physicians alike, and may even allow individuals to regularly check for potential illness before contacting a medical facility – a substantial boon, given the importance of early diagnosis. An ideal detection product would be much like a pregnancy test: add a drop of blood, urine or saliva; red means sick, green means not. Such disposable kits aren’t in the realm of sci-fi fantasy: Microfluidics allows the enterprising engineer to design laboratories in the miniature, where each chamber in a fingernail-sized chip contains a reactant to be added to a sample (of bodily fluids, cell lysates or any other analyte) as it flows through a microscopic channel. Fast, cheap and consistent, lab-on-a-chip approaches easily have the potential to surpass their macro-scale counterparts, which often require their analytes and buffers to be in volumes greater by orders of magnitude. Microfluidic devices have cropped up for anything from HIV detection to the safety testing of prospective drugs, each with an intricate set of design principles and engineering tricks – and a research team at UNAM, led by Prof. Mehmet Bayındır, has recently added a new trick to their arsenal: Miniature channels that run on the edges of polymer fibers, transforming these age-old structures into a veritable new medium for microfluidics applications. The team’s way of synthesizing microwires takes no futuristic-looking, excruciatingly precise assembly mechanism – the entire process starts with a large chunk of Teflon. Fashioned into a rod, the Teflon core is then wrapped with a shell of polyetherimide, heated to melt the layers together, carved into a cylinder with twenty notches along the edges, slowly fed into a furnace, and pulled – and therein lies the crux of the method. As the polymer composite is heated, it becomes ductile and yet retains its notched shape, allowing its size to be reduced without compromising its unique morphology. Once the drawing is complete, the resulting fiber can be fed again to the drawing tower, shrinking down in each iteration until micro- or nanoscale nanowires are obtained. While the group has previously produced nanostructures using this method, the emphasis on microfluidics in their current work led to the fabrication of microwires with diameters varying between 30 and 500 microns. The fiber channels were then coated with an additional layer of polydopamine, allowing water and other fluids to flow smoothly across their surface, without leaking from one channel to another, and in only one direction – useful properties for a prospective microfluidics device. But a series of parallel trenches does not make a device : for that, these trenches must be made to interact in a controllable manner. 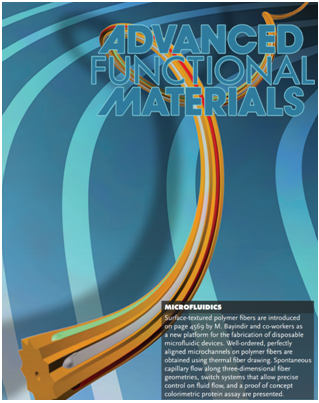 This interaction is provided by creating larger assemblies of fibers – like K’nex pieces, individual lengths of microfiber can be connected to each other, and their directional wettability ensures that fluid is rapidly transferred from one to another. The flexibility of these fibers allows them to be connected in any configuration, and the spread of fluid can be controlled using “switches” where two unconnected fibers are linked on demand. Further modification of the fibers allows the production of more complex structures, two of which were fabricated to demonstrate the efficiency of the material in replicating biological assays, with HSA and bromophenol blue, a dye that changes color upon binding with HSA. Simple but versatile, the team’s microfiber arrays can be connected in various configurations to perform assays of any complexity, and further modifications to the microfiber structure may be employed to meet the specific needs of more demanding reactions. Bayındır group, meanwhile, is focusing its efforts on advancing their size-reduction technique not just for microfluidic devices, but also to create novel nano- and micromaterials to be used in photonics, optoelectronics, biosensors and functional materials of any other bent. Their work is supported by TUBITAK under project no. 110M412 and the European Research Council under the European Union’s Seventh Framework Programme (FP/2007–2013)/ERC Grant Agreement no. 307357.